Dolomites paintings - Portrait of the Pale Mountains. 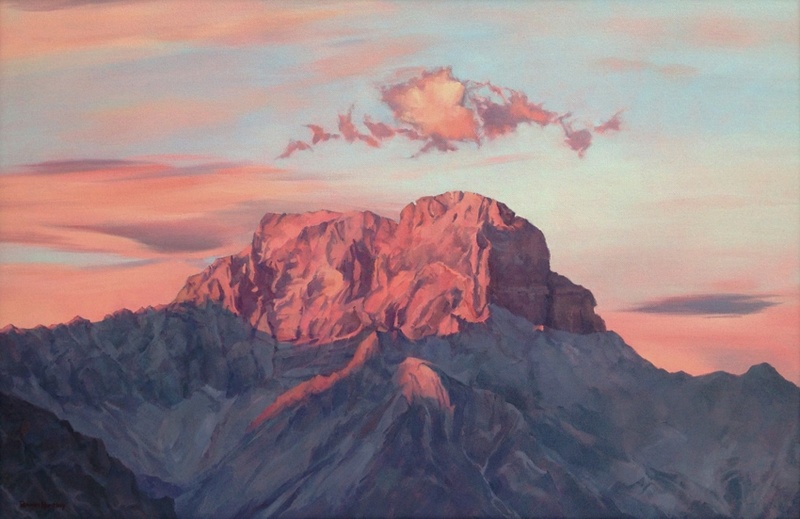 HomeEvents Dolomites – Portrait of the Pale Mountains. 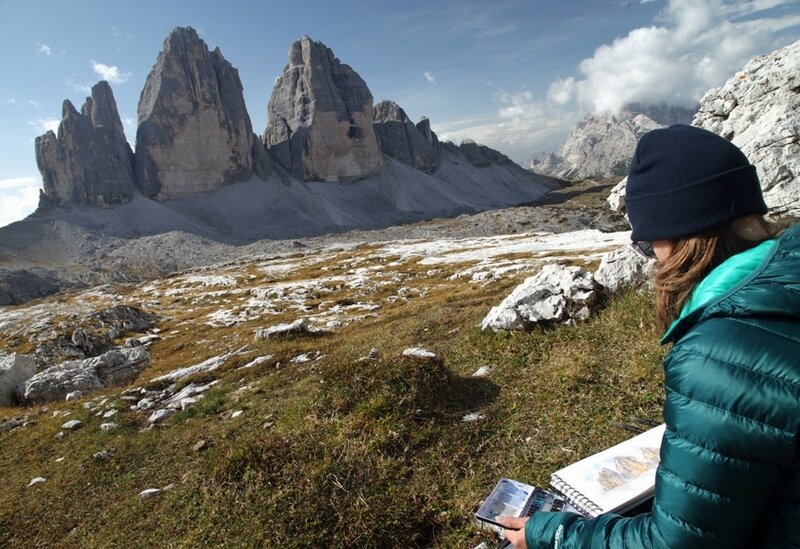 Rowan says of her work: “I have loved exploring and getting to know the amazing landscape of the eastern Dolomites with its distinctive, complex, fabulous geology. It has been challenging to paint but the alternately snow-covered, rain-lashed and sun-baked terrain together with its superb changing light have been thrilling and a real joy to work with. This beautiful landscape is all about the rock, the mountains are not particularly high but what they lack in height they certainly make up for in design. Unusual formations and the colour-changing qualities of the rock produce strong images when combined with sparkling light and the dramatic weather of the area. It is complicated subject matter with lots going on both close up in the rock and in the wider landscape, so I faced making many decisions about what to include, or leave out, in each picture. It has been a great exercise and has challenged my painting ability as I hoped it would. Based in Pozzale di Cadore I travelled around with my sketch book, visiting Sassolungo/Langkofel, the Sella Group, Marmolada, Civetta, Cinque Torri and Pelmo, Tofane, Cristallo, Sorapis and Tre Cime di Lavaredo/Drei Zinnen to name but a few! I visited in the month of May and again in September so I was lucky to see some fresh snow, and by staying in Rifugios such as Scoiattoli and Locatelli I was able to enjoy the beautiful colours of sunrise and sunset in the mountains. I returned home to the UK with lots to work with and have greatly enjoyed painting the Dolomites in my studio here. I hope to visit again some day soon”. The exhibition Dolomites – Portrait of the Pale Mountains can be seen online from 9 November at www.rowanhuntley.co.uk. To see the exhibition in London please contact the Alpine Club on +44 (0)20 7613 0755 to arrange a visit. Copyright for all images is ©Rowan Huntley.